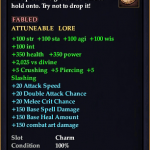 The previous Thursday and Tuesday hotfixes have brought some itemization changes, specifically with the increase in the number of items holding Red Adornment slots, the introduction of Yellow Adornments for heroic gear, and the addition of Resists to Legendary and Fabled gear (previously, players were expected to run around with 2-3 pieces of Mastercrafted jewelry). 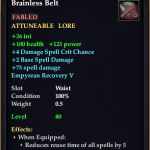 Thanks for your patience with us as we look at items, spells, and combat arts. We are reading your concerns and are trying to make adjustments where we can. This week we have been hard at work on raid item changes. 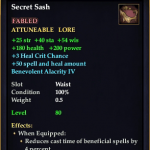 Those changes should happen in the next hotfix, so please don’t transmute those drops, you may want them after the changes hit. 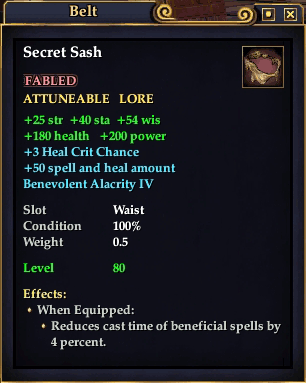 After the changes next week, we are going to be looking at resistances on Legendary drops and some other things as well. Please understand, we have a lot to think about. The expansion, battlegrounds, and the golden path added a lot of content that we have to keep an eye on. The content team did an excellent job with the golden path and if you haven’t tried it, you might want to talk to a chronomage or roll a new character to check it out. Battlegrounds are a lot of fun too, even if you don’t like PVP combat you might want to give it a shot because the cooperative team play is a lot of fun. I am not trying to make any excuses, but instead I am trying to say that there are only so many hours in the day. An interesting thread, which I’ve been following, on whether the +Defense and +Parry skills have any utility whatsoever. Frizznik and Xelgad are looking into the Crit Multiplier for Wards with regards to Shamans. They are currently falling behind Druids. 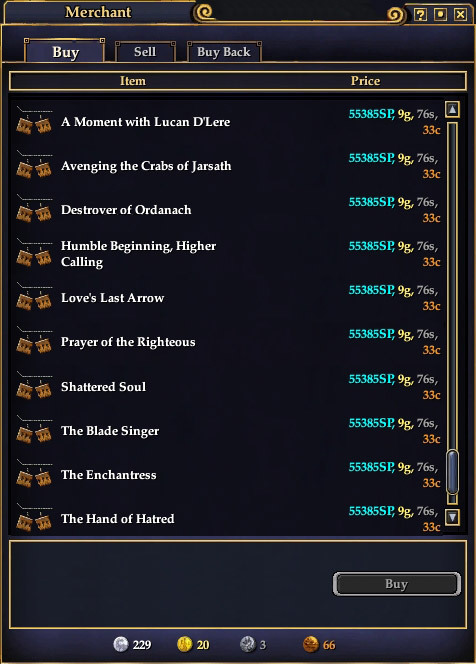 A handful of Legendary items from level 80-83 received Yellow Adornment slots, however Yellow Adornments were all initially flagged level 84. This has been remedied in the March 18th hotfix, as they are now level 80 adornments. 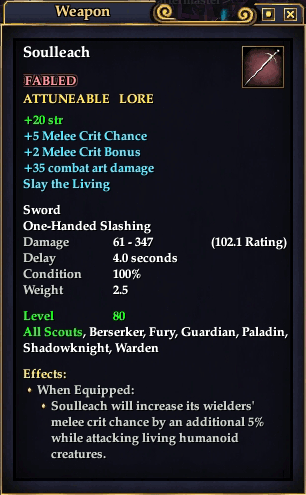 Flurry — results in 2 to 4 additional mainhand weapon swings. These swings do not proc additional procs. AE Auto-Attack is primarily an AA line that points can be spent in. 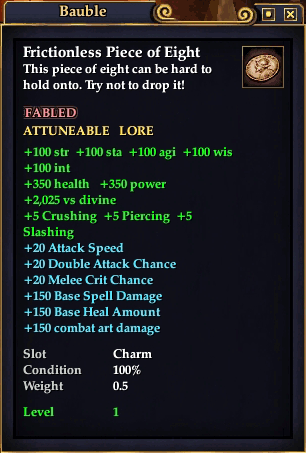 Double Attack has a cap of 100% and now appears widely on gear of all kinds. Flurry is much rarer to find, and is mostly found in AA lines, but look for it on items. Whether you are rewarded Tier 2 or Tier 3 raid gear is dependent upon which raid mob you are killing, and whether you are taking on the “easy” version of that mob, or the “hard mode” version of that mob. Hard mode mobs typically have more adds, more hitpoints, unique effects, stronger detrimentals, etc. Don’t forget that Moonlight Enchantments start tonight!! We’re still working on part 2 of the Sentinel’s Fate Itemization Puzzle. SF Gear is still in a state of flux, and we now know that the “Tier 3” Sentinel’s Fate raid armor, which drops from the hardmode version of each mob are all being upgraded, loot tables adjusted, etc. so it’s hard to get an accurate picture of the gear at this point. Fyreflyte, itemization lead for EQ2, has been conspicuously absent from the EQ2 Forums in the last couple of weeks. Further, Xander, Frizznik, and timetravelling have all been stepping in to answer itemization-related questions. It is unclear what, if any conclusions can be drawn from this. Meanwhile, a former EQ2 developer, Aeralik, has been posting some of his perspectives on how the Shadow Odyssey expansion played out behind-the-scenes. He still holds forth that he fought the good fight for the players against the Fighter Revamp and other sweeping, ill-considered changes. EQ2 team members I’ve spoken to on the condition of anonymity dispute this viewpoint. Brewday has arrived in Norrath! This celebration of Brell and brew will run from March 11 to the 22nd. Although the event is now available on live servers, Brell’s Bar remains closed until 10:30am PST according to an announcement I read in-game. 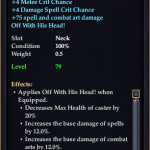 For further discussion on Brell’s Bar, check out the EQ2 Forums. Join Sony Online Entertainment at Bally’s Las Vegas, from August 5th through 8th, for three days of fun and games at Fan Faire 2010. If you’ve never been to an SOE Fan Faire before, this is the time to make the trek to Sin City! Fan Faire is a great place for gamers to mix, mingle and meet with some of the faces behind their favorite SOE titles. Cool giveaways and other fun items! And that’s just the beginning! Visit the Fan Faire website at www.soefanfaire.com for up-to-date information on registration, pricing and schedules. Tickets are expected to go on sale early this spring. The special SOE rate at Bally’s Las Vegas is currently $65 plus tax on Thursday night, and $85 plus tax on Friday and Saturday night, while supplies last. 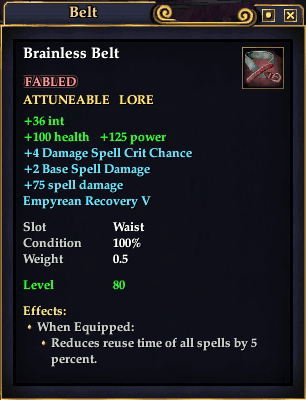 Second Fan Faire in-game item for your primary game! Yes, this means you get two with a Platinum Pass! Unlimited green screen photos with the backgrounds of your choice! VIP Check-In Lounge for Platinum Pass Holders only! Private VIP events for Platinum Pass Holders only! You don’t want to miss out on this! Details to follow! Thursday — Welcome Reception, Fan Faire weekend sneak preview. Friday morning — SOE sessions and panels, live events, and in-game tournaments. Friday afternoon — Game-specific Q&A sessions and panels, live events, and in-game tournaments. Saturday day — Game-specific Q&A sessions and panels, live events, and in-game tournaments. NOTE: There is no guarantee they won’t change the schedule for this year. For more information, and for the promotional code to book your hotel, check out the official SOE Fan Faire 2010 Website. 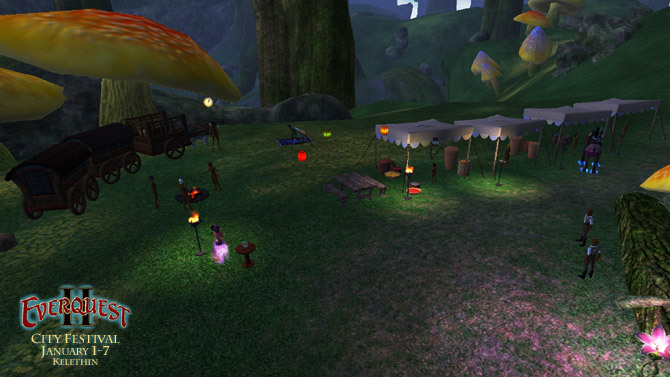 Brewday is coming to Norrath, with all new rewards, quests, and recipes. As always, the best previews of these live events can be found at Niami’s EQTraders site. Here’s her Brewday 2010 Preview. Brewday shall run from March 11 – 22nd this year. Check out that awesome backpack!! The City Festival has rolled into its third destination since these Festivals began in January. The first event was in Kelethin, then Gorowyn. Today, the City Festival arrives just outside the gates of the city of all things dark and gloomy — Neriak. Once again, a selection of both local and traveling rewards, house items, and temporary costumes become available. It has been an interesting week, to say the least. Expansion launch weeks always are. It’s also been a rather bumpy ride for the servers and developers resolving issues that made it through Beta. What is the Golden Path? The phase of the moon is just right and the mushroom rings will be active again for a short time. There are more house items and other rewards than ever for the Moonlight Enchantments event this time around. The event will turn on at 12:01am PDT on February 20th and run until 11:59pm PDT on February 21st. These times apply directly with no time conversion to all servers. Erollisi Day is now on Test and according to a forum post by Kaitheel, we should expect this event to be on Live servers from February 4th until the (February 16th). Among other things we can expect in this event are another variation on Nektropos Castle related to this event, new quests in Antonica and Thundering Steppes, and more tradeskill and house item goodness. City Festivals are now live. The first one is just outside of Kelethin near the Butcherblock Mts. ramp. City Festivals are held the first week of every month. If you have been doing city writs, tradeskill work orders, etc. you may have noticed a curious item — City Tokens — as quest rewards. 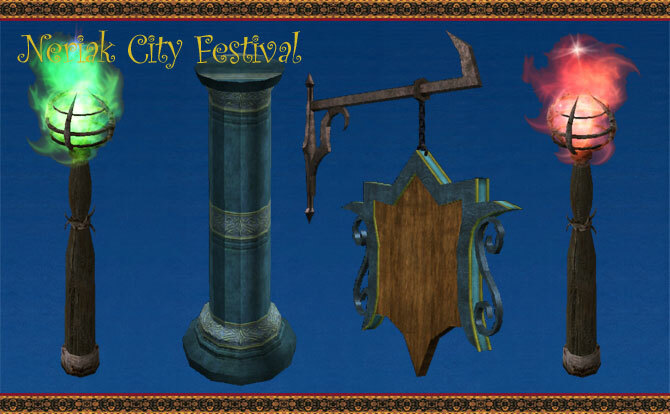 City writs, tradeskill writs, and special quests only available during the City Festivals will all earn you City Tokens which can be spent to buy house items, special appearance gear, etc. For all those folks wishing to see more activity in the cities, here’s your chance. These festivals are accessible to all alignments regardless of city due to them festival parking just outside the city gate and offering quests to all who visit. If you haven’t run all of the Frostfell quests, including the Icy Keep: Return which requires a group, or any of the other quests, tradeskilling, etc. don’t miss out! Frostfell ends January 7th. EQ2Wire would like to wish a Happy New Year to all of you. We’ll be back with more news about the EverQuest II: Sentinel’s Fate expansion and any other news in the world of Norrath soon. Some of you may be interested in these Frostfell-themed items coming to StationCash Marketplace on December 22, 2009. The event will turn on at 12:01am PDT on December 20th and run until 11:59pm PDT on December 21st. These times apply directly with no time conversion to all servers. The servers are coming down in a few minutes for what will be a 9 hour downtime for some server maintenance, a hotfix to hopefully fix the multitude of bugs introduced with Game Update 54, and of course to patch in Frostfell!! Servers will be back up at 10am PST or 1pm EST. Kiara has brought us the great news about the Six Year Veteran Rewards. I have to say these are some great items!! 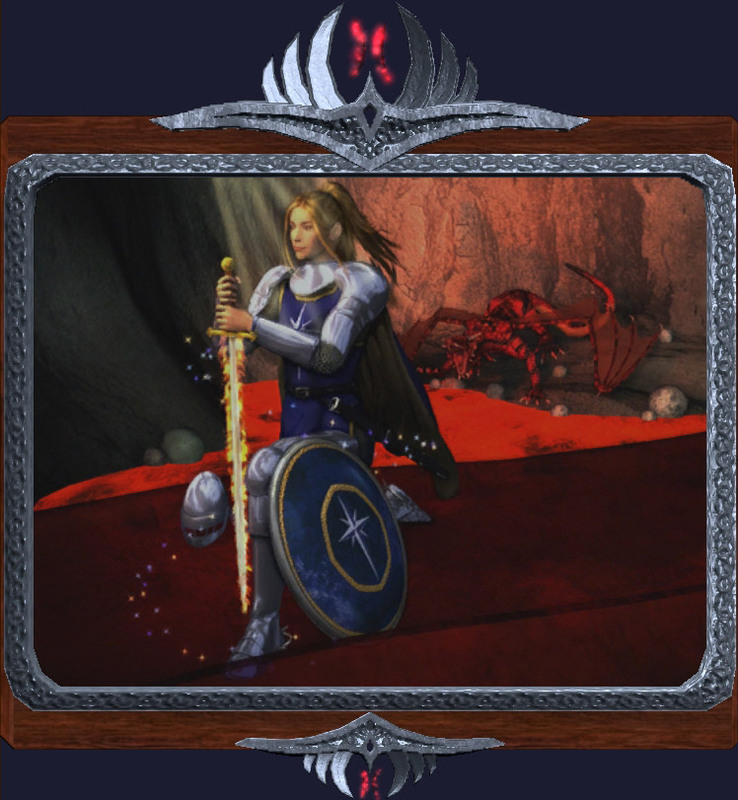 Check out the preview at EQ2Players. Also, Frostfell is expected to appear in Norrath on December 10th. The First Prize winning “Destroyer of Ordanach” by Citadelli. One of the nine Second Prize winners “Prayer of the Righteous” by Enna. 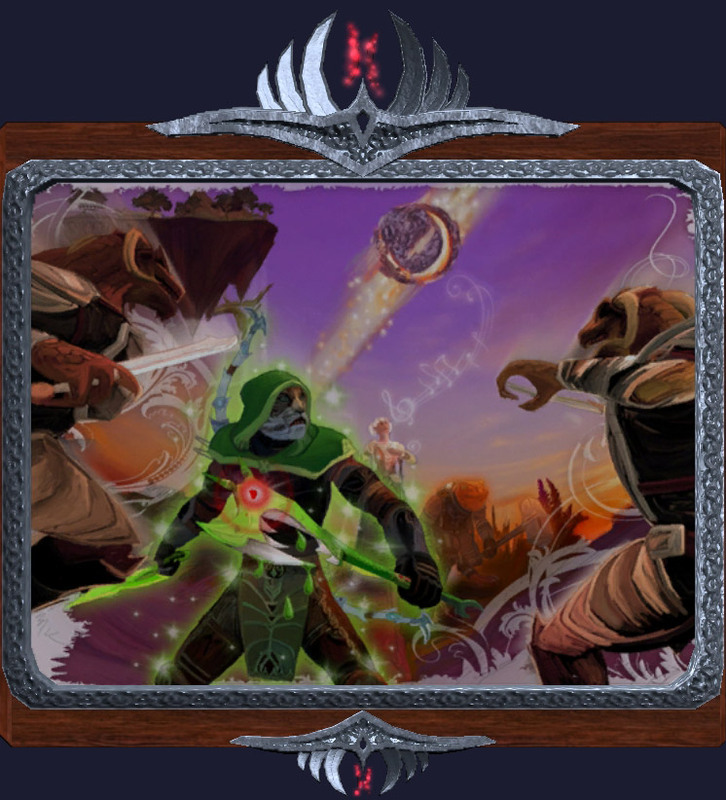 All 10 paintings can be viewed at your local City Merchant or at EQ2 Wikia. These items may be available later on, but for the time being, they are only intended to be available for this 5th anniversary celebration week. Join the Discussion on EQ2 Forums. The Heroes’ Festival has begun! A call has gone out to all Norrathian adventurers to commemorate the five years that have passed since the Refuge Islands first began collecting those lost in the turbulent oceans. Celebrators, happy to share in the festivities, can be found in North and South Qeynos or West and South Freeport. Quest starters are in North and South Qeynos, as well as West and NORTH Freeport. Note: This is the EQII 5th Anniversary event, which went live on November 24, 2009 and is expected to end on November 30, 2009. Note: Currently these 5 year anniversary events require The Shadow Odyssey expansion. This was unintentional and a hotfix will correct the issue. It seems very odd to the EQ2Wire that an event which will only last 7 days has a reward that will never be available again and there is no announcement on EQ2Players. Windslasher brings us news that the Qeynos/Freeport World Event first mentioned a few weeks back will be activated on Test and Test Copy hopefully this evening. This should be the source of storylines and lore expected to lead us into the Sentinel’s Fate (Odus) expansion. As soon as we have more info about this event, and whether it will go live with Game Update 54 (Will of the Tyrant), we’ll let you know! Niami DenMother and Kaisha of EQTraders.com can always be counted upon to provide excellent coverage of Crafting and Live Events. Check out the EQ2TC GU54 Crafting Overview for more details – it already has the furniture shots for the first City Festival event (clothing shots will be incoming as time permits), as well as a page showing both the returning and the new Glacial Furniture from the Icy Keep vendor in Frostfell. Mmmm, love that bed! Finish your work on the spires event now, get your shopping done, earn your title, finish up any incomplete spires, etc. When GU54 goes live, you will no longer be able to quest and earn tokens. Note that, by popular demand, Titles were added to the Quellthulian Spires Merchant, but these are still only on Test. Hopefully these updated Merchants are available on the live servers long enough for everyone who is sitting on a stack of Tokens to get them. Understandably, some players are taking a look at Game Update 54 (aka the Great Bug Stomp) and not seeing a lot of new content. Part of the issue is, normally, we would be just 2 weeks away from an entirely new expansion at this point. However Sentinel’s Fate won’t hit until February. Also, it is now unclear just when we can expect Shaders 3.0, although I’m hopeful that we’ll get it as an early Christmas present. Of course, we have Frostfell 2009 to look forward to this December. If this year has proven anything, it is that live events get bigger and bigger, with significant new content each year (next year, I figure it will take all 20 days just to complete all the old and new content of Nights of the Dead!!). Seasonal and recurring live events (eg. Moonlight Enchantments) have been extremely popular, so a lot of attention is being focused on them. And now it turns out that in response to many complaints that Guild Halls and other game design decisions have “emptied” the home cities, a new recurring event is being introduced in Norrath: City Festivals. The Far Seas Trading Company is proud to introduce a traveling festival for all to participate in! When this event goes live, a different city will be chosen to host a week long event, once each month. Gorowyn, Neriak, Kelethin and Freeport will each get their chance to host their version of the event. On Test and Test Copy the great city of Qeynos is the first to find the traveling caravan outside it’s gates in Antonica. Adventurers will find new quests, collections and rewards, many of which are city specific! And for those of us that don’t want to wait for the festival to reach our city’s gates, we don’t have to. City Tokens are now being given as further reward for completing city writs! This event should now be available on Test and Test Copy and we’ll report back soon with the details. Remember, the Spires event is still in-game and some of the rewards from that event may not re-appear in EQ2 for a long time. In addition to the variety of house items, there are some unique items like the Magic Mouth house/guild hall item which can be set up to make announcements to passers-by. And don’t forget in-home teleporters. You buy them in pairs, right-click to name each one, and then you can port between them. One perhaps overlooked feature of Game Update 54 is larger Backpacks. The largest size using a rare component (Mahogany) is now a 40 slot backpack with 20% weight reduction. You can read more about these here. Nu’roga now has plunderable loot! Malicious Thoughts and Icicle Explosion now trigger on ranged and melee attacks. Frostburn and Mutagenic Burst now correctly modify each other’s damage. Purifying Persistence should properly modify the caster’s heals rather than the targets. The Cloak of Crystal Shards, Assassin Master’s Cloak and Cloak of Runes returned from Collector Rattelis are now Heirloom. Icy Prison now has 3 shield effectiveness to match its deflection chance. Charm of Solusek Ro once again triggers multiple times on AE casts, however its effect is now limited to 5 targets. The Master’s spell reflect percentage has been greatly reduced. In the final hard mode fight with Miragul, his Brilliant Adepts will no longer stun/mez players within a second of initially spawning, but will wait 3-6 secs after spawning to start casting. The Miragul encounter (Hard mode): Miragul will now cast Curse of Confusion on up to 2 players per cycle, rather than 3. The Vampiric Protectors that spawn during the Mayong encounter will now respawn in the center of the room if they break, rather than rapidly spawning and despawning near the point where the encounter broke. 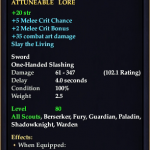 Certain items that drop from Munzok have become slightly more powerful. Overlapping unstable void protrusions should provide protection from Munzok’s edict as expected, and no longer conflict with one another. Additionally void protrusion protection now more closely matches the sphere’s size. Munzok’s max health has been reduced. Altius Volfban in the Hollow Hedge should be much easier for mage classes to handle. The Headless Horseman now spawns somewhere near his tree instead of just in the same spot every time. He also requires someone offer him the necklace instead of simply taking the necklace near him to activate. His respawn has also been lengthened slightly. The Nightmarish Ceremonial Armor has gotten a slight change to color. The Nightmarish Ceremonial armor should now all have an equal chance of dropping. Altius Volfban now has a chance to drop a piece of the Nightmarish armor when killed. The Blanket of Fog now comes with a remote so you can turn them on and off. In the off state it should be much easier to tell where they are! The option to always show the threat window has been moved from Game Features to Options->User Interface->Game Windows. To compensate for the server wonkyness, server downtimes, and slow start on the event, Moonlight Enchantments is extended through 11:59pm PDT October 22nd. Sorry for the late post on this but Butcherblock, Nagafen, and Lucan D’Lere servers are currently down to complete the maintenance which was attempted last week. Note that ALL 3 servers are being upgraded at this time. Hopefully at noonish Pacific time, we’ll be running 64-bit and see some significant improvements to zoning time, zone lag, etc. This is to let you know that Nagafen, Butcherblock, and Lucan D’Lere will be down from Midnight PDT tonight (October 19th) until Noon PDT Tuesday October 20th, while the team migrates Nagafen (only!) [all 3 servers] to the new DB structure. As you all know from last week, the migration process did a little wonkiness with some of the longer character files. In order to prevent this from happening again, Nagafen [the 3 servers] will be migrated by hand. During this downtime, bonus exp will be enabled on Venekor and our Nagafen players are encouraged to make alts over there to take advantage of the exp boost. We’ll also look into having the mushroom rings extended on the affected servers so that no one misses out. The plan is then for the server merge between Nagafen and Venekor to take place on Thursday (more details on that will be forthcoming). As previously mentioned, the Moonlight Enchantment event will be extended for these servers (and others as well because gnomes got into the works!). Thank you again for your patience while we migrate the databases for these servers and we apologize for the inconvenience. Hey all! Between now and 12:30pm PDT today (October 20th) folks across most servers may notice broadcasts saying that the server will be shutting down or restarting — you can ignore these. The only servers that will be affected and be down are Nagafen, Butcherblock and Lucan D’lere and they are still scheduled to be up again at roughly 12:00pm PDT. So once again, players can ignore the server restart broadcasts and we apologize for any confusion it may cause. In other news, Moonlight Enchantments got a late start today, so my understanding is it will be active for another full day on all servers. 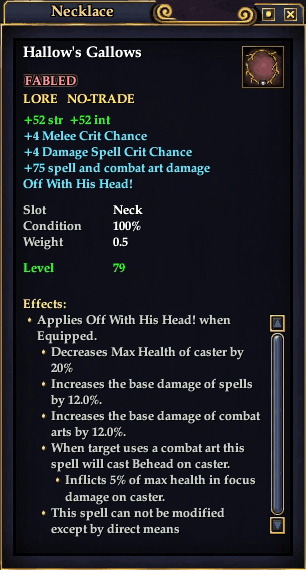 Another item as part of Nights of the Dead you may not want to miss may make your head a little more Foggy than usual. Again, if you’d rather figure it out yourself, then don’t visit this forum thread on the EQ2 Forums. 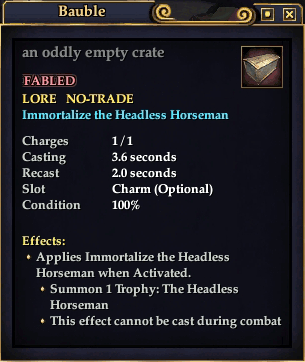 The Headless Horseman is on a 1-2 hour spawn timer. Have fun out there! 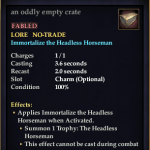 We may see some changes to the Headless Horseman on Monday. Note that some players are reporting issues with the new Hedgemaze zone (an instance of Cauldron Hollow). Not all players have been able to progress beyond the “Trick” step.